Water slides come in many shapes, sizes, and colors, and checking out a variety of water slide pictures can help you discover what kind of aquatastic thrills you are interested in. Types of slides include tube, body, and speed slides, bowls, half pipes, flumes, and enclosed slides. With so many to choose from, water slide pictures can help you learn about different slides before you take the plunge. Many water parks offer a variety of slides to choose from, and by knowing what to expect you can be sure to enjoy each water slide. Mat racing slides offer face-first fun and are a great choice for groups to enjoy. Most mat slides are straight with several mild dips that lead to a final runout. Flume water slides accommodate a larger number of riders in a large inner tube. Gentle curves, dips, and steep sides are the fun elements of these water slides. Many body slides, especially those with steep drops, end in a shallow runout area instead of a deeper pool. This makes them more suitable for many riders, and they can be placed in smaller areas. Water coasters, like this indoor version, are distinctive because they use water jets to propel riders uphill throughout the ride. Bowl design water slides use a short entry slide for riders to build up speed before they enter the bowl, and after swirling around the bowl they will exit through either a drop or another short slide into a splash pool. Fully enclosed slides are all the more exciting because riders cannot see the dips, turns, and drops coming up in the slide’s course. New generation enclosed water slides use special lights and musical effects to make the ride even more exciting. Some slides even allow riders to choose the music and light show before they ride. Water slides are such popular attractions with all ages that they can even be found on cruise ships, such as this serpentine body slide on the Carnival Pride. Many parks use towers that serve as the starting point for several similar slides, such as this collection of serpentine slides. Body slides can use a series of dips or one steep drop for riders to gain speed before plunging into a pool. If you don't get enough fun at a water park, try out a backyard inflatable water slide for splashtastic excitement all summer long. 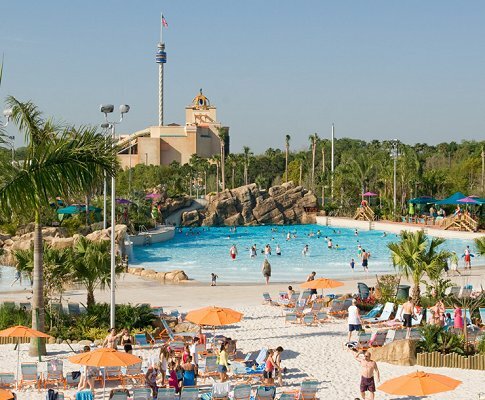 For more information about different types of water slides and how to make the most of your day at a water park, check out Water Slide Oops, or the Master Blaster Water Slide. Don't forget, indoor water parks have great slides to enjoy too!